The paddy and cotton fields looked inviting as I walked up a small path between two fields amid an eager group of boys and girls who chatted, laughed and greeted me, while their teacher came forward with an extended hand. He had earlier informed me that he had been selected for the post of TGT (Trained Graduate Teacher). “What are you going to do”? I asked. This small school, which he and another teacher managed, was a rural haven. It was a small lower primary State board school. He had conducted many experiments in his classes here and the children were completely devoted to him. But he knew that he needed a larger field, more challenges and opportunities to grow. It was unclear to him what the direction of his growth would be. He had taught in higher classes under the RMSA (Rashtriya Madhyamik Shiksha Abhiyan) scheme and had gained the confidence of students there, conducting experiments in improving reading skills. He appeared unsure about whether he should take up a job there or continue his work here! Another school, another teacher, another warm welcome! I observe his class, talk to the children and we organize a small game. The children respond enthusiastically. “You are doing a fine job with the children,” I tell the teacher. “Are they from around here?” “Yes, they are all children of labourers,” says the teacher. “They are irregular and parents often take them away for work.” He tells me that he is a local and is a first generation learner. He has mastered English with great difficulty. His desire is to be a good English teacher. He tries to attend every language workshop even if he is not on the list. He reads any book that he can lay his hands on. He sincerely believes that if he attends enough workshops he will be equipped with whatever it takes to be a good teacher. Miles away from the city, on a dusty road, right in the middle of a settlement is a school where a teacher is trying to juggle both administrative duties as a headmaster and his teaching duties with the small bunch of kids who eagerly perform skits. Yet, these children can’t read. “Why don’t you buy some picture books which the children can look at? Later, you could sit with them and talk about these stories,” I suggest gently. What are his concerns? No time to read, no access to information, too many duties, he says. I have been a master trainer, he says, but all that is left behind once you come to school. There are many such stories of teachers – those who struggle to do something new, applying ideas and thought in continuous experiments but do not have the guidance and direction, and depend solely on others to provide them with a professional development package and many more who are so overwhelmed with day-to-day problems that they are demotivated. These state government schools, where the teacher is the only source of learning, the textbook the only reading material and the midday meal, the only nourishing food, are situated in rural and remote areas. Here information reaches people at the pace of an ant, there are no newspapers and there is a total lack of resources which the urban information-rich environment takes for granted. The teacher is also a part of this and is unaware of his/her own role in her professional development. Institutional support for this development is only in the form of workshops which are neither need-based nor relevant to the context. What is Continuing Professional Development? Where does it begin? Who supports it? What triggers it? These are questions that we need to answer as teacher educators if we are to usher in quality in education. Continuing Professional Development is a teacher’s self-driven initiative directed by her need to grow. But this initiative needs a nurturing environment, which could be social but should more beneficially be institutional. The nurturing need not be stifling with structured courses and schedules with pathways marked out. It needs to be supportive with access to information, guidance and critical friendship within reach of the teacher. Recognition and appreciation of efforts in the form of sharing, disseminating information about the best practices is surely an important part of this nurturing. This need for a nurturing environment for the teacher should be recognized by the government and policies regarding teacher professional growth need to take this into cognizance. How can one bring about awareness among teachers that they need to drive their own professional growth? How does one support the professional growth of motivated teachers in remote and rural areas? Many initiatives by government and non-government organizations exist, impacting small pockets. 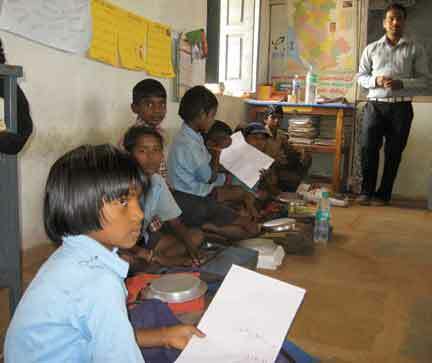 One such initiative by the Azim Premji Foundation is the Teacher Learning Centres in three blocks of Shorapur in Yadgir District in Karnataka. These are informal spaces where teachers spend their evenings playing together and bonding. They discuss academic issues and explore opportunities for growth. This kind of space brings teachers together as a community and provides access to growth opportunities. There are other informal spaces like the Lohit Youth Libraries set up in Arunachal Pradesh. These are places where confidence blossoms under non-threatening support. Can we somehow institutionalize these spaces while maintaining their informal and supportive structure to nurture the soil of professional growth and encourage individual enterprise? The author is Specialist, Academics and Pedagogy at Azim Premji Foundation, Bangalore. Her work spans the areas of Teacher Support in English Language Teaching, Teacher Capacity Development and designing courses for teachers and teacher educators. Her interests are in the area of integration of technology in Continuing Professional Development. She can be reached at nivedita@azimpremjifoundation.org.